Some of the most powerful words in the English language are, “Tell me a story.” Human beings are storytellers and story-listeners and, as James K. A. Smith observes, “Our hearts traffic in stories” (108). The literature of the world expresses our greatest stories, tales that transcend time and place and convey universal human experiences. In 12 chapters, Prior elegantly examines how 12 virtues are embodied in the classic works of authors like Charles Dickens, Jane Austen, Cormac McCarthy, Mark Twain, Shusaku Endo, Leo Tolstoy, and Flannery O’Connor. Prior highlights the cardinal virtues of prudence, temperance, justice, and courage; the theological virtues of faith, hope, and love; and the heavenly virtues of chastity, diligence, patience, kindness, and humility. Brazos Press (2018). 272 pp. $19.99. Acclaimed author Karen Swallow Prior takes readers on a guided tour through works of great literature both ancient and modern, exploring 12 virtues that philosophers and theologians throughout history have identified as most essential for good character and the good life. In reintroducing ancient virtues that are as relevant and essential today as ever, Prior draws on the best classical and Christian thinkers, and she explores some of the most compelling universal themes found in the pages of classic books, helping readers learn to love life, literature, and God through their encounters with great writing. Prior begins by grounding the cultivation of virtue in the glory of God: “Human excellence occurs only when we glorify God, which is our true purpose” (23). And because literature can embody both vice and virtue, she aims to help her readers grow in recognizing both, opposing the former and cultivating the latter. Prior proves an insightful guide to great works of literature. I’ve included a few examples to give a sense of her lucid brevity. In her discussion on temperance and F. Scott Fitzgerald’s The Great Gatsby, Prior laments the “suffocating weight” of Jay Gatsby’s excess consumption, and then wisely observes, “Consumption does indeed consume us” (59). According to Prior, diligence is the “most humble” and “perhaps even the most boring” of the virtues (178). Yet diligence is a necessary ingredient of perseverance. The steady, persistent effort of Christian on his dangerous journey to the Heavenly City embodies this virtue in John Bunyan’s Christian classic The Pilgrim’s Progress. “Even excessive injustice cannot extinguish the light of goodness,” Prior argues in her examination of justice and Charles Dickens’s A Tale of Two Cities. “From such a vast and dark ocean of wrong, bright rays shine forth from small towers of fortitude, lighthouses in the dark” (80). In her exploration of the virtue of hope in Cormac McCarthy’s dismal post-apocalyptic novel The Road, Prior remarks: “Paradoxically, the bleak world of The Road is an affirmation, even a celebration, of what is good, all the more marvelous in a world with so little good seemingly left in it” (131). Prior doesn’t just show how these great stories embody virtue (or its lack). She also demonstrates how reading literature well provides readers with the opportunity to practice virtue through habits of mind. “Reading well is, in itself, an act of virtue, or excellence, and it is also a habit that cultivates more virtue in return” (15). How, then, does one pursue the joyful and demanding goal of reading virtuously? Reading virtuously begins by reading closely, by understanding the words on the page, by “being faithful to both text and context, interpreting accurately and insightfully” (15). This habit of close reading, or deep reading, actually helps to cultivate virtue, because this kind of reading requires patience, the fuel of attentiveness; it requires prudence, a key for interpretation; and it requires temperance, a necessity in setting aside the time required to read well. Reading well will almost certainly mean reading more slowly. Literature ought not to be gulped down like fast food but digested slowly with careful consideration. “Just as a fine meal should be savored, so, too, good books are to be luxuriated in, not rushed through” (17). We live in an age when skim reading seems to be the new normal, and so we’re in constant danger of skimming ourselves to death. We live in an age when skim reading seems to be the new normal, and so we’re in constant danger of skimming ourselves to death. Certainly some books ought to be skimmed. 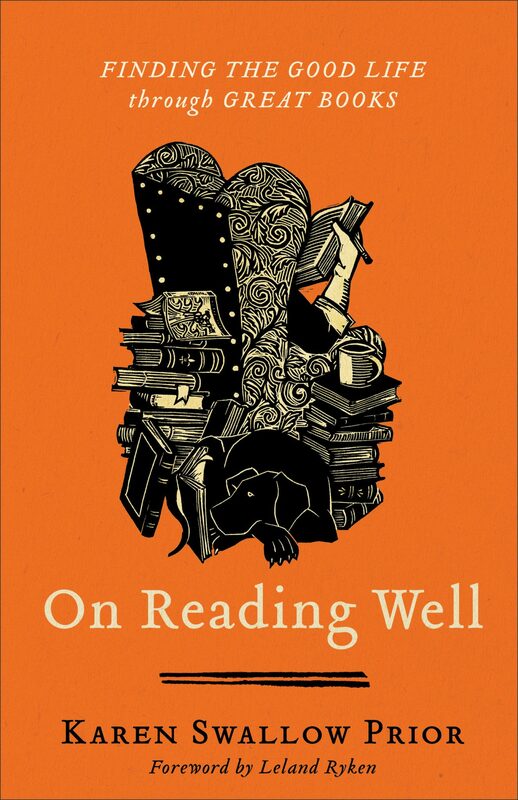 Even Francis Bacon advised, “Some books are to be tasted, others to be swallowed and some few to be chewed and digested; that is, some books are to be read only in parts; others to be read, but not curiously; and some few to be read wholly, and with diligence and attention” (73). But if we aren’t careful, our ability to do deep reading will become a constant and losing struggle (5). Slow reading fosters plodding, pondering, reflecting, ruminating, and lingering. In order to remain actively engaged, Prior encourages reading “with a pen, pencil, or highlighter in hand, marking in the book or taking notes on paper” (17). Aside from the highlighter option, this is sage advice. This habit of reading literature well doesn’t develop overnight. It takes time and practice. “Just as water, over a long period of time, reshapes the land through which it runs, so too we are formed by the habit of reading good books well” (19). But the effort that goes into such a cultivation of habit, Leland Ryken notes, pales in comparison to the manifold rewards of reading these kind of stories well: “Literature helps to humanize us. It expands our range of experiences. It fosters awareness of ourselves and the world. It enlarges our compassion for people. It awakens our imaginations. It expresses our feelings and insights about God, nature, and life. It enlivens our sense of beauty” (34). On Reading Well is exquisitely written and will appeal immediately to a certain kind of reader: the kind who reads a book review about a book about the virtues embodied in reading books; the kind of reader who finds it impossible to pass by a used bookstore without slipping inside in search of a story that will stir a homesick hope within; the kind of reader who, like David Copperfield, reads “as if for life” itself (59); the kind of reader who joyfully affirms with C. S. Lewis, “My own eyes are not enough for me; I will see through those of others” (140). But even if you’re not yet that kind of reader, Prior beckons you to become one. You won’t find a scolding tone or any long list of books you simply must read before you die. Instead, acting as the English professor we all wish we had in school, she humbly kindles a desire in you to leave her own book behind and reach for that daunting work of literature you’ve never quite finished and was never quite finished with you. I suspect this was one of Prior’s goals all along. The 17th-century Puritan pastor Richard Baxter wrote, “It is not the reading of many books which is necessary to make a man wise or good; but the well reading of a few, could he be sure to have the best. . . . Good books are a very great mercy to the world” (151). Karen Swallow Prior has written a good book about some great books that help us consider and pursue the good life. That is a great mercy indeed, pressed down, shaken together, and running over. For as the apostle James writes, “Who is wise and understanding among you? Let them show it by their good life, by deeds done in the humility that comes from wisdom” (James 3:13). Nick Roark (MDiv, Southeastern Baptist Theological Seminary) serves as the pastor of Franconia Baptist Church in Alexandria, Virginia. Nick previously served on the pastoral staff of Capitol Hill Baptist Church in Washington, D.C. He’s the author of Biblical Theology: How the Church Faithfully Teaches the Gospel. He is married to Allison, and they have three children.